Minutes after his mother was killed in a brutal explosion and while her remains still burnt all around him, Matthew Caruana Galizia was assaulted and punched in the face by a man who stopped near the burning remains to take photos. Matthew Caruana Galizia told me how a man driving a silver SUV parked next to the burning wreck of his mother’s car, moments after the explosion that killed her, walked out of his car and apparently used his mobile phone to take photos of the conflagration. Matthew Caruana Galizia was on the scene “running around in a blind panic trying to work out what to do”. He described to me the man taking photos of the scene of the crime as “rough-looking, in a pink checked shirt, jeans and with a heavy silver chain around his open neck”. Matthew Caruana Galizia tells me that “instead of trying to help, calling the fire brigade or asking what was going on and what he could do, (the SUV driver) sauntered up to the field (where the car was still burning) holding his phone up, then stood there talking more photos as the car continued to burn”. “The only other people there, were the two policemen who turned up with a fire extinguisher. The unidentified man then turned around, walked back to his car, which was parked right next to where the bomb went off, got in and started the engine. He asked one of the policemen something to which the policeman replied, ‘Orrajt, orrajt ħi. Tista’ tmur, m’hemmx problema’ without questioning him or holding his car within what should have been a sealed crime scene”. 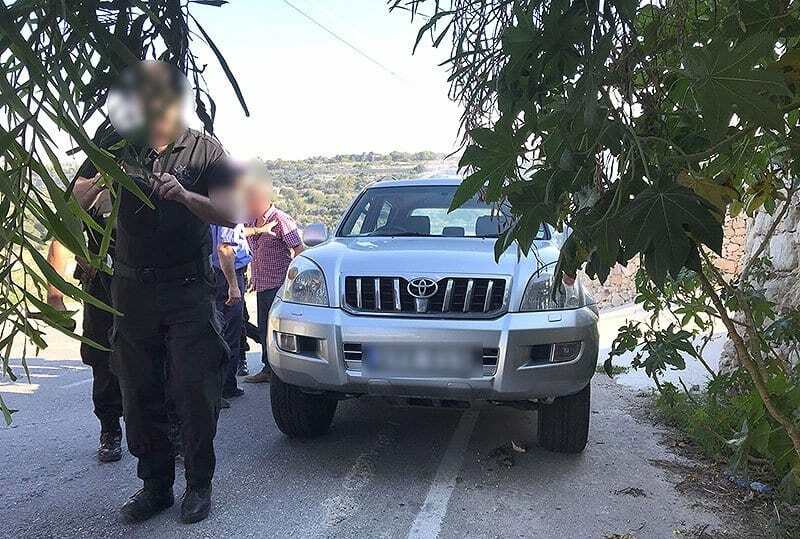 Matthew Caruana Galizia told me he “walked right up to the policemen and told them that (the man in the SUV) had taken photos. The man, who up until that point had completely ignored me, said, ‘Hux photos, photos! Ara ħa!’ and passed his phone through the window. I smashed it on the ground to create a reason for the police to hold him and the screen cracked. The man got out of his car and punched me on my left cheek, right below my eye. He continued trying to assault me while the policemen tried to hold him back. They held him for about an hour then let him drive off, without searching his car”. This photo show the car and driver in the incident with faces and number plate blurred. I have seen the original unblurred image. So many thoughts come to mind. Firstly that policemen on site did not think that preserving the scene of the crime required them to eliminate all possibilities about cars and people close to the scene, that they did not think the photos he appeared to take might be useful for future investigations, that they did not think that assuming the individual was an innocent bystander, his behaviour was odd and needed looking into, and that an assault on the victim’s son required action. Secondly that it appears that basic human compassion is completely absent in people with a phone in their hand. That the basic humanity of offering assistance and comfort to someone as obviously in need as Matthew was, and the basic civic duty of looking and asking for help, are lost completely. But the excitement of taking a photo of a fire is not. That in that first encounter of Matthew Caruana Galizia with the rest of his own species after the moment that would so brutally and irrevocably change his life, he met someone whose behaviour would perfectly represent the self-centred egoism, the utter lack of empathy, the hostility and violence he would get over and over again after that. This person’s primary concern appears to have been for his own phone and the photos he used it for. Those puerile concerns over-rode the manifest suffering of a young man orphaned in a hellish scene from the worst nightmare. “Orrajt, orrajt ħi. Tista’ tmur. M’hemmx problema”. That so eloquently sums up the coldness of a society incapable of feeling other people’s pain even in their darkest hour.